Screen Gems’ comedy Think Like A Man Too took the top spot at the weekend Box Office with $30 million. 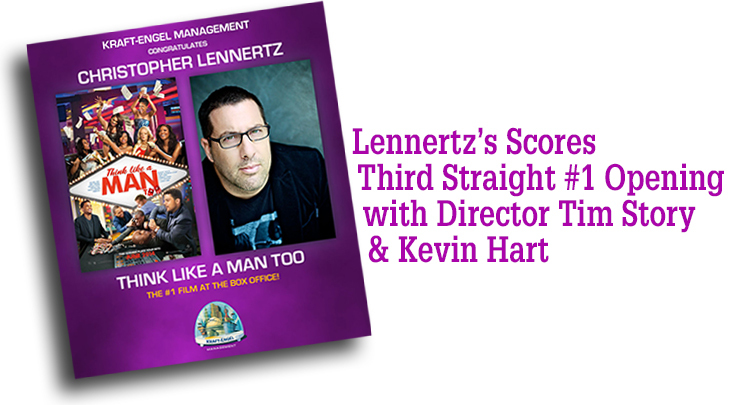 This is award-winning composer Christopher Lennertz’s third film with director Tim Story starring Kevin Hart, and the team’s third straight #1 opening following Ride Along and Think Like A Man. The sequel’s lively Las Vegas setting inspired Lennertz to raise the bar musically. Lennertz incorporated big-band style brass and Rat Pack rhythms for a swaggering, jazzy score. The Think Like a Man Too score album is now available on Varèse Sarabande Records. Think Like A Man Too brings all the couples back for a wedding in Las Vegas. When plans for the bachelor and bachelorette weekend go awry, their various misadventures get them into some compromising situations that threaten to derail the big day. Lennertz’s score not only sets the tone for the film, it also compliments Kevin Hart’s fast paced comedic delivery. “The challenge with scoring Kevin is that his delivery is so fast and perfectly timed out. He’s so funny that I just need to give him musical lead-ins and punctuation, then make sure to get out of the way when he really takes it up a notch,” explained Lennertz, who is also scoring Hart’s upcoming comedy The Wedding Ringer, releasing in 2015. Christopher Lennertz is an award-winning composer for film, television and video games. Lennertz’s success stems from his breakout score for Alvin and the Chipmunks, which grossed over $360 million worldwide. Since then he has proven his talent by scoring star-studded comedies Think Like A Man, Horrible Bosses, Hop, and Ride Along. Recent projects include box office hits Identity Thief, and the critically acclaimed drama, Thanks for Sharing. Upcoming film projects include the comedy sequel Horrible Bosses 2 and romantic comedy The Wedding Ringer. Lennertz’s television credits include NBC’s hit series Revolution and the CW’s landmark series Supernatural. Lennertz’s credits in the video game world include the finale installments to both Mass Effect 3 and Starhawk. Other video game credits include Medal of Honor, the James Bond: 007 series, Gun, and Madden NFL 25. The music is available from Amazon.com, Amazon UK, Amazon France and Amazon Germany.